So today I introduced my class to the 3 Act Lesson. I am now instructing a wide range of age levels in my room, so I decided to start with a lesson that I felt would be easily accessible for all of my students. The choice of my lesson was also influenced by the fact that I received a shipment of LEGO EV3 robots yesterday, the lesson was Bubble Wrap by Dan Meyer. The first issue that came up was the image of Dan himself. Like my many comments on Andrew Stadel’s striped Monster’s Inc. sweater, students had to make comments about Dan’s appearance and facial expressions. The good thing is that their attention to details really brought out great conjectures about the problem. After we worked through the problem, I had my students answer a reflection question not based on the problem itself, but the lesson format compared to a different one they are used to. 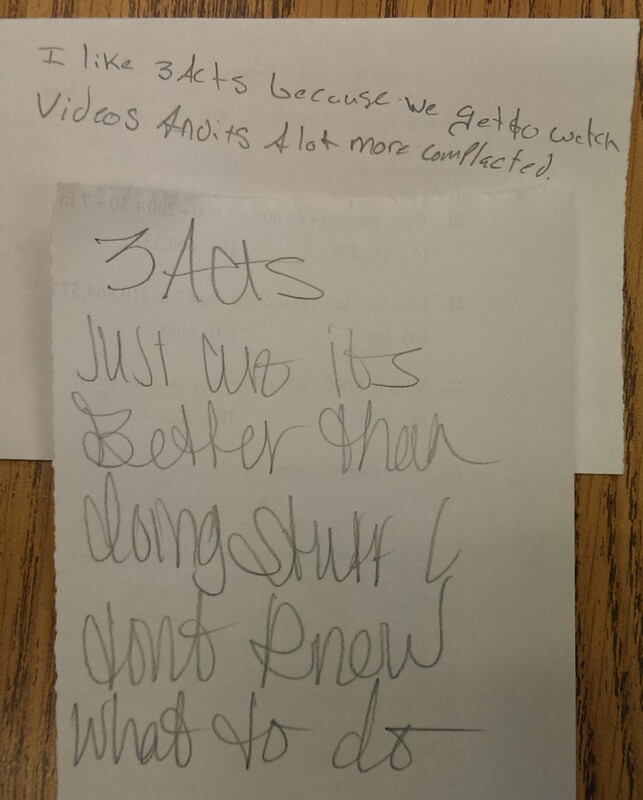 Consider the 3 Acts lesson we just did in class and what you would consider a typical mathematics lesson. 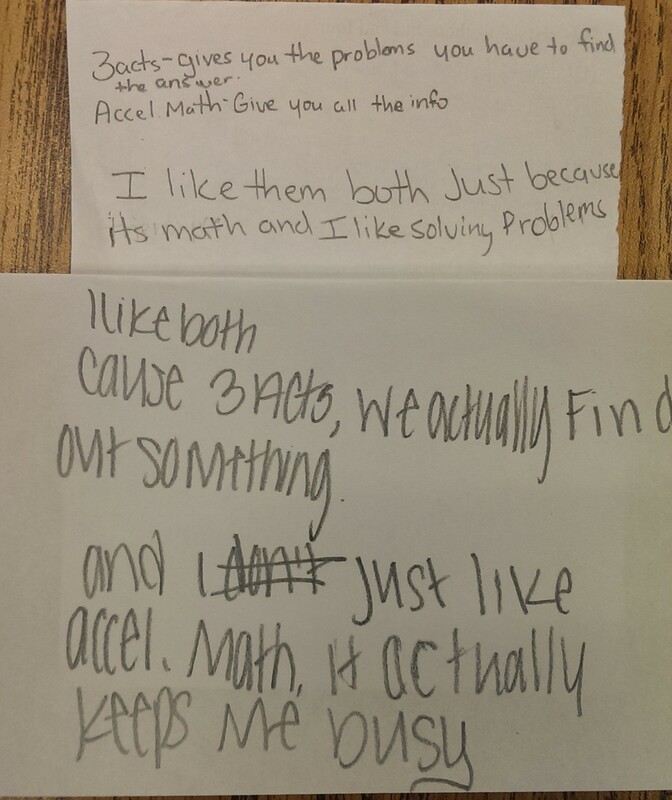 Since I work with high risk teens, a lot of them are used to a program called Accelerated Math. It is a program that is highly student specific in content, but proper teacher support is a lacking area. Typically students get too comfortable or familiar with the curriculum and attempt to manipulate it in order to do as little as possible. Creativity points to these students, but we really need to break them of these habits in order to ensure they are being challenged appropriately and are learning new content instead of practicing concepts already mastered. 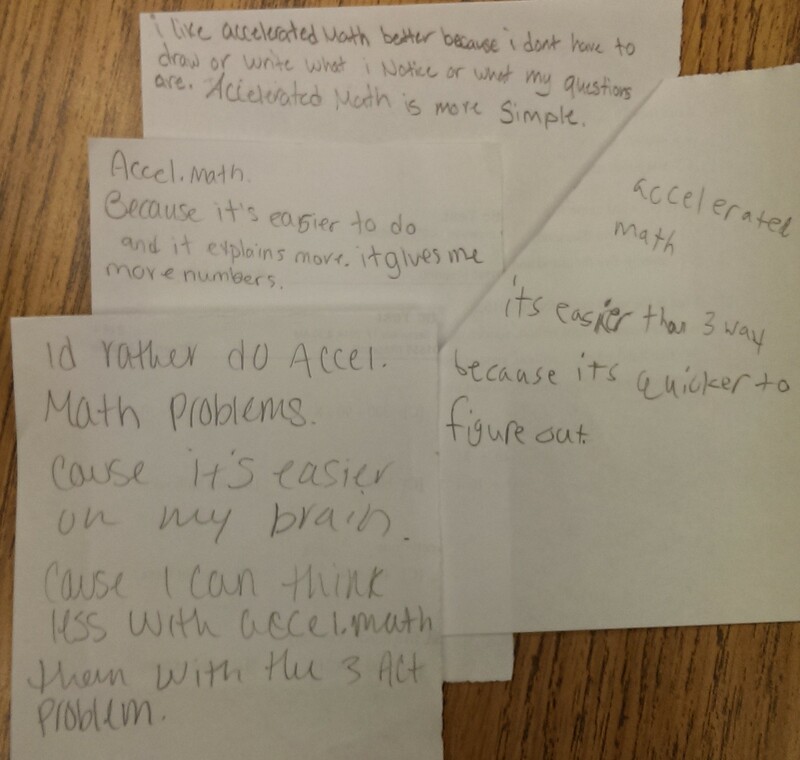 Here is a few of my student responses to the reflection question. These responses are typical for ~85% of the students I see. They do not want to challenge themselves in their work, they only want to do enough to get a passing grade. Many do not even care what grade level they are working at, some even consider the grade levels as a way to judge social status. They want to be given worksheets, with bare number calculations. They want to use a calculator to find the answer to basic math operations performed on single digit numbers. Asking students to compare, contrast, communicate their ideas is something that is “too much work, it makes my head hurt.” Typically I find these students to be more concrete, and seeking established routines to follow. Consider your students, and look at these responses. How many of them are actually sitting in your classroom right now? There are also the students who can’t make up their mind, those that like learning, but at their prerogative and speed. Consider these reflection statements. They enjoy being able to explore the mathematics and find their answer, yet they also like being handed all the information for manipulation. How can this be? From what I have observed recently, I am starting to get a good idea why. These students are ones who enjoy learning- but only when you catch them in the “right mood.” This typically means they do not see a large value in school overall, it is something they have to endure until they are old enough to be out on their own. They want to be busy, because classes can be boring if there is nothing to do. They want class to be safe, they don’t want to have to invest themselves in learning or their teacher (though not all the time, they do show you brief, amazing flashes). When you hit that good mood, invigorating hook or great topic they become so engaged they forget everything- you see incredible thought, work and communication. They remember how fun it is to be able to explore things and find answers. Ride this wave as long as you can, because something as little as a look from a peer can cause the student to shut back down into mediocrity. Of course, there are the few who want to be challenged. Consider the following student responses. Giving students the opportunity to learn through a different experience while making use of prior knowledge really impacts their learning and outlook on math. It shows students that they have more skill in an area they have labeled themselves as “bad” in. They can talk with peers, provide critical details, reason scenarios out and find solutions without asking the teacher if they are doing things correctly. It builds connections in their learning that will reach out from the simple application of answer finding in class, and will encourage students to come to you about classroom project or curriculum proposals. I know we all feel that our schedule is so loaded that we can’t deviate from this grand master plan we have for the year, but I have found student suggestions about upcoming lessons engage the students in a way that a week of planning can’t. Is 3 Acts the savior of mathematics? To this I would say not yet. I am starting to think of Math instruction like food (typical American thinking I know! ): everyone likes a variety of food, and everyone has their cravings. Craving the same mathematical practices every day will be like eating chocolate cake for every meal- it may provide short term energy to the classroom, but will not fulfill your student’s need for a wholesome teaching approach. 3 Acts is something I feel is very important in class, just don’t abuse it’s effectiveness. Brayden celebrated his 6th birthday this May. Every year we mark his height on the shed door frame. What questions do you have when you look at this picture? Ask students to write down their questions, I normally ask students to find at least 3. When I observe that most students have questions written, I ask them to share those questions with their neighbor. I then throw up a Microsoft Word document and start typing down questions students supply. Students from my classroom came up with all sorts of different questions, some we can easily answer and others that we can’t. I am looking for a key question or questions to start this lesson. If students do not ask one of these questions, I tell them that I hope I can answer most of the questions provided, but that I need them to consider one of these questions first. How much does he grow in a year? How tall will he be next year? How tall will he be as an adult? Any of these type of questions will lead students down the inquiry I hope to explore with them. My wife and I are fairly tall people, and Brayden wants to be at least as big as us so he can play basketball (he seems to think he needs to be tall to play). How many years will it be before Brayden is 6′? I also ask students to create an equation for the Brayden’s height growth per year (he was 22 inches when he was born). Students will round that to 3.8 inches per year. So, solving for y=72 gives me Brayden’s age of 13. Using the average model, students will get the same answer. After we decide the general equation for Brayden’s height, I will ask students to predict Brayden’s height at various points in his life (16, 18, 21, 30, 40, 70). Some students will just blindly evaluate what his height will be without considering the fact that we do stop growing as adolescents. What questions do you have when you watch this video? What is changing from one frame to the next? What are the different different pieces called? How do you square binomials? These are both excellent topics and students generate a lot of classroom discourse discussing each one. Patterns: Students will notice that I first make a square, each side the same length as the initial picture. The thing that switches up is the replacement of a “flats” for “longs”, “longs” for “cubes” and then fill the square with “cubes.” Once students get the idea of the first couple of squares, then I will introduce math vocabulary for these: “flats” = x^2, “longs” = x, and “cubes” = constant. Squaring Binomials: Students will make the same observations as the pattern students. Using the math vocabulary, they should create expressions of what they are shown, and what it becomes. Students may make notes of individual changes; x^2 replaces the x, etc. This should lead them into the idea of squaring, or raising the binomial to the power of 2. 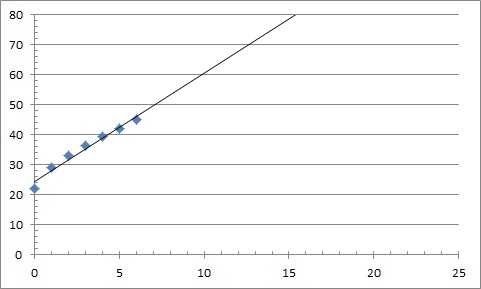 Discussion should happen about how the constant value is added at the end, wasn’t the constant replaced by x? Some students will even try to physically measure the cubes versus the long to create a ratio. Patterns: I ask students to create their own binomials, their squares and sketches of diagrams of both. I will then ask what happens if there is a negative on either the variable or constant and how that effects our pattern. Squaring Binomials: I ask students to try a quadratic and see if they can square it. Ask students to summarize what the activity was about. Ask students what mathematics they explored. Ask students what they understood really well. Ask students what they felt they needed more instruction on. How many tables are there? How many people are in a row? 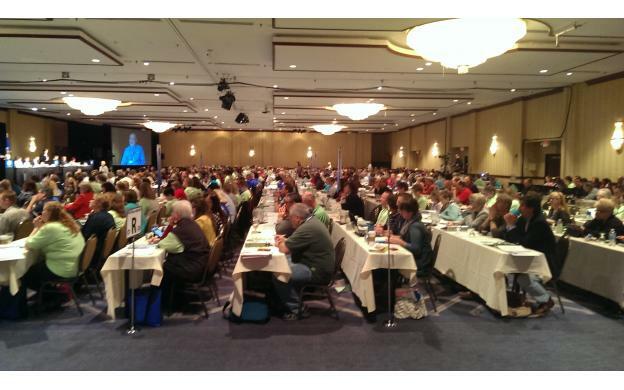 There are 512 attendees at this conference, how many tables are needed to seat them all? How would this change if I needed to seat 900 attendees? There are 8 people seated at the head table, but they needed to use 6 tables (extra space was used for the podiums). Otherwise there are 4 sections of tables, 9 rows of tables to a section, 14 people to a row, and the table size is 6′. These are hard to identify by the picture so the students really work on the following pieces of information: 6′ tables, 9 rows and 512 attendees. I also ask students to create an equation for the number of tables that are needed. For comfort reasons, 2 people are seated per table. You will need 7 tables per row. 4 x 9 x 7+ 6 = 258 tables. Then I typically ask them how many tables per row, and what type of configurations makes sense for the conference (does one LONG row really work?). After we decide the general equation for the conference, I then ask the students how many tables are needed for varying amounts of attendees: 200, 900, 1200, 2500. What type of configurations would work for these new conventions? This video was inspired from comments made in Dan Meyer’s My Opening Keynote for CUE 2014. Is this an Arithmetic Pattern? Is this a Geometric Pattern? How did you make a cube? Patterns: Students will notice that I first make a square, each side the same length as the initial picture, and then a cube with each side the length of the number of cubes in the square. The cubing part is where most classes will struggle, many will just try to create a cube out of the preceding square. Rules of Exponents: This is what I designed this video for, in an attempt to create a visual representation of (x^a)^b = x^(a*b). Using the unifix cubes created a quick, easy way for students to quickly see and do the mathematical calculations. The powers I started with were easily recognizable visually: (x^2)^3. One thing my students start to see is how the base figures into all of this, we normally pause the video and use the SMARTBoard to draw lines to create the pattern of multiplying the base. For example on slide 3: we circle the bottom left 2 blocks, one stack represents 2^2, two stack represents 2^3, four stacks represent 2^4, etc. Rules of Powers: Have the students determine a third power and sketch what their figure would look like & how many blocks it would take to create it. This video was first brought to my attention from Dan Meyer’s My Opening Keynote for CUE 2014. Turn the volume on mute when you show this to your students. I also do not show the individual run, I start the video 15 seconds in. I show the clips of Jacoby Ford and Terrence Cody ending at a minute in. How much of a lead does Rich get on run 2? run 3? How much does Rich lose by each time? How big of a lead does Rich need to tie? to win? These are all excellent topics and students generate a lot of classroom discourse discussing each one. Rates: This is one that creates a lot of arguments about precision. Students normally start trying to time Rich by using the clock on the wall, or their wrist watch. Some will break out the stopwatch feature. I have other students use the watch feature on their phones. Timing issues like accuracy starting or stopping the time, cause quit a disturbance with the students. Graphs: I love this part. I normally show a clip twice and have students graph the race. Independent and Dependent variables, scale factor on axis, and the solution of two lines are great topics to discuss. Students really enjoy graphing the races and are really good at evaluating work and refining the process and answer. Equations: This normally involves at least one of the first two processes and builds upon that. 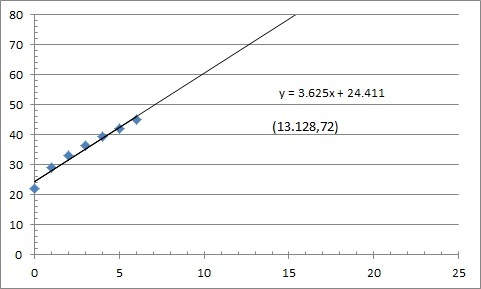 Finding the rate of each runner (their slope) and setting their expressions equal to each other leads to when Rich is overtaken. Having these expressions will also allow us to find the exact time Rich is passed and how much of a head start he would need to either tie or finish first. I can’t think of a better introduction into solving systems of equations. I normally show the opening video to answer how fast Rich runs, and turn up the volume to allow students to know how much of a head start he is given in the other races. Show them the 3 man race (1:10 into the video) and let them loose, it’s fun to watch. What questions do you have after seeing this Video and Picture? What is the shoe size? Is it like a 52? How big of a foot would you need to wear that? How big/tall would a person be to wear this shoe? These are all excellent ideas and I place them on the board as reminders to where we want to go throughout the investigation. Depending on what focus I use this for, students normally fall into 3 strategies for finding our answer. Proportions: Most students want to make a proportion relating themselves to Shoebacca. This is a great strategy to begin with, but since I teach 8th grade students, I want them to push themselves. This strategy would work well with our 7th grade standards. 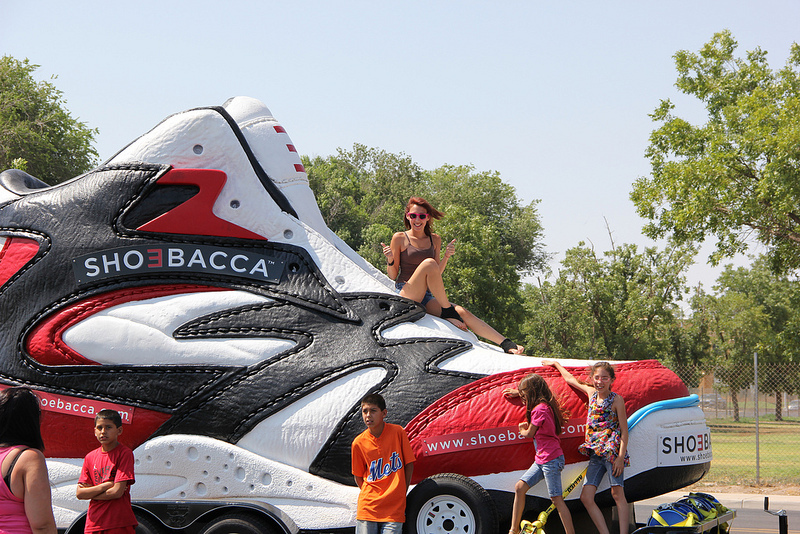 Statistics: One thing that comes up when we start exploring Shoebacca is the fact that we can’t accurately predict how big someone’s foot depending on their height. Students immediately think of mean (or average) and start taking down everyone’s foot size and height (this is also great review of measurement and conversion- students this past year put up their height in feet, inches and I asked for inches only, and for some classes, cm). Then the next step students wanted to take was strategy 1, they made a ratio of their class average and made a proportion. Once again, a great way to tackle this problem, but I am relentless- I want them to really explore different options of solving this problem and how those strategies relate and compare. Graphs: When I first designed this problem, this was naturally MY first thought. One thing all great teachers do is anticipate how students will approach a problem and then tie it into the method they are presenting. I anticipated the first two approaches and hope my students will make connections between them and this one. One of the reasons I like looking at graphs is it allows students to use software to enter data, find trends, and display it graphically. 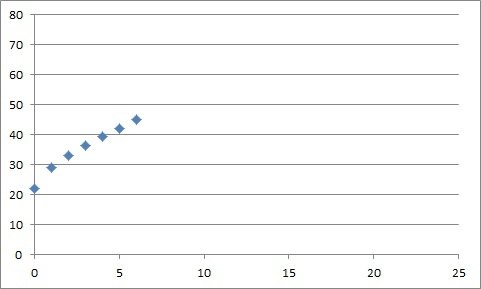 Students take measurements of their class, place it in a spreadsheet and create a graph. They can then look at lines of best fit (before you automatically create it with the program) and make a conjecture based on their data. Some other considerations: The length of the trailer which will determine how big the shoe length is, can be varied. I normally go with what the students discover- many will do searches on trailer sizes. The most common lengths I get in class are 12′, 14′,16′, 18′ and 20′. This variation of the trailer size could be a extension of the problem. Some great discussions resulted in the difference in these estimates for height.